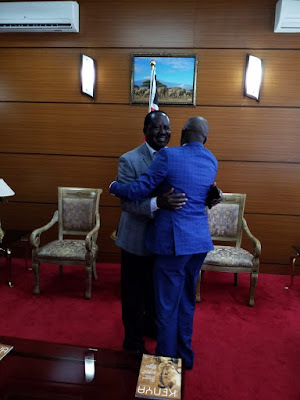 Tuesday July 31, 2018 - NASA leader, Raila Odinga, has moved to assure his supporters that the relationship between him and President Uhuru Kenyatta has never been better, especially after the handshake that saw him join the Jubilee Government. Speaking on Sunday, Raila noted that he and Uhuru were still on course to eradicate the political squabbles which have riddled the country in recent elections. He urged Kenyans to support the Building Bridges Initiative which he started with Uhuru to bring the country together. “People should not be jittery,'' said Raila. The NASA leader also revealed that he joined the Government to stop the bloodshed in every election cycle. “We wanted a peaceful and prosperous nation, not a bleeding and anarchic country," he said. He remained optimistic that the 14-member team he and Uhuru chose to implement the handshake and steer the unity agenda will deliver and asked Kenyans to be patient. “We want a peaceful country,'' he concluded.